The new SVEHLZigZagTicks indicator by Sylvain Vervoort is now part of our TASCIndicators library. We coded it as a trailing reverse indicator which marks the reverse of a trend following a move of a certain number of ticks off the last price extreme. It can be applied to any bar scale, not just Tick-based charts. Crossovers and crossunders of the indicator line can be used to trigger trend trades. Also, we've extended the already published SVEHLZZperc indicator to accept "points" (read: ticks) as input in addition to the other types of price movement (percent, ATR, and combined). Figure 1. 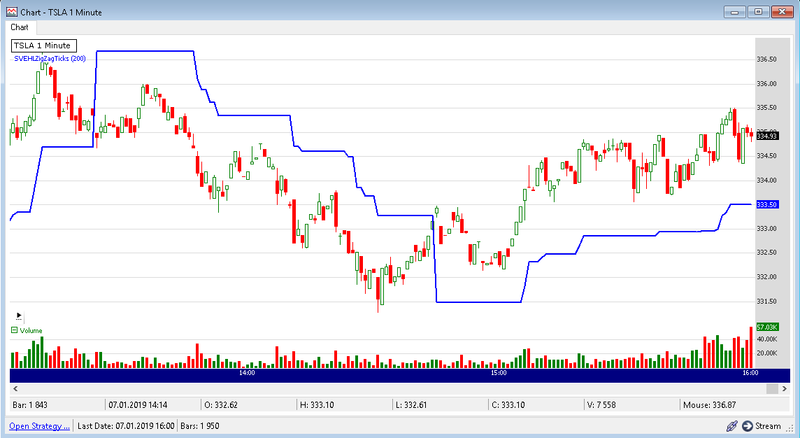 Application of the indicator to a 1-minute chart of TSLA (data provided by AlphaVantage). After updating the TASCIndicators library to its latest version, the SVEStochRSI indicator can be found under the TASC Magazine Indicators group. You can plot it on a chart or use it as an entry or exit condition in a Rule-based Strategy without having to program a line of code yourself.